Occupying Sinhala Navy was adamantly refusing to release the occupied residential and livelihood twin-islet of Ira'nai-theevu, informed Ilangkai Thamizh Arasuk Kadchi (ITAK) sources told TamilNet. The SL Navy officers were citing the ‘defence’ of the so-called ‘sovereignty’ of genocidal Sri Lanka as the prime reason, at a meeting held in Muzhangkaavil on Thursday, when two ITAK MPs from Vanni met SL ‘State Minister’ for Defence Ruwan Wijewardene, SL Navy commanders and D.M. Swaminthan, a SL ‘Cabinet Minister’ of Resettlement, Prison and Hindu affairs. Finally, a token measure has been promised in the form of allowing Poonakari Divisional Secretariat to survey only 159 of the entire 1,200 acres of lands. At least 783 Eezham Tamil families were living there when they were uprooted for the first time on 10 August 1992. The islets have continuous residential history of 400 years. Since 01 May 2017, the uprooted people have been waging a continuous protest at Muzhangkaavil, situated on the mainland, 12 nautical miles from their native twin-islet. On Thursday, Sinhala Navy officials were re-iterating four reasons for their unwillingness to allow the people to resettle in Ira'nai-theevu. The first reason was that ‘outside forces’ would be infiltrating into the so-called sovereignty of the occupying SL State if they allowed Tamils to resettle there. Then, the SL naval officials said it was a high security area with ‘crucial’ radar installations. The SL Navy personnel also started to allege in the meeting that Ira’nai-theevu would be used for drug trafficking into ‘Sri Lanka’. Later, adding another reason on their defence, they were also admitting that civilian resettlement would be counter-productive for their military corporatism. The SL Navy has been commercially cultivating seaweed (Kadal-paasi) and other aquatic submerged herbs along the coast of the twin-islet. The SL Navy was also refusing to release the fishing jetty, the sources further said. The meeting took place at the SL Navy base, which is located at Muzhangkaavil. Ira'nai-theevu is situated 12 nautical miles west of Muzhangkaavil along the coast of Vanni in the Palk Bay. Informed civil sources told TamilNet that millions of foreign funding was being deployed through Sinhalese run NGOs having US connections. The Indian Government doesn't seem to be concerned of the hostile military occupation and foreign funded operations in the twin-islet close to its territorial waters, they added. Genocidal Sri Lanka would be prepared to collaborate with either USA and China, trading its geo-strategic location in the Indian Ocean Region. The ultimate losing party in the game has always been New Delhi due to its misplaced loyalties in the island and taken-for-granted attitude towards Tamil Nadu, Tamil political observers commented. The meeting on Thursday comes as the uprooted families have been waging a continuous protest demanding de-militarisation and resettlement of the island. The SL ministers were touring the twin-islet in a helicopter after the meeting. The uprooted people told TamilNet that they were determined to continue their protest until coastal, residential and farming lands are released back to them to enable full resettlement. 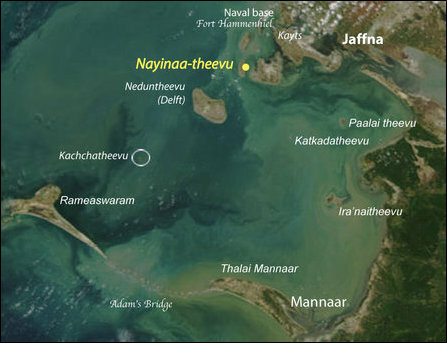 They also said there are at least five islets without residential records in the area — Paalai-theevu, Katkada-theevu, Erumai-theevu, Kaakkai-theevu and Kachchat-theevu — where the SL Navy could relocate itself with its military equipments. Around 500 families, numbering around 2,400 individuals, are staying in the temporary settlement. The remaining 25% of the population from Ira'nai-theevu are staying in Oalaith-thoduvaay and Theavanpiddi in Mannaar and some in Jaffna district. Some have also displaced to Tamil Nadu in India. 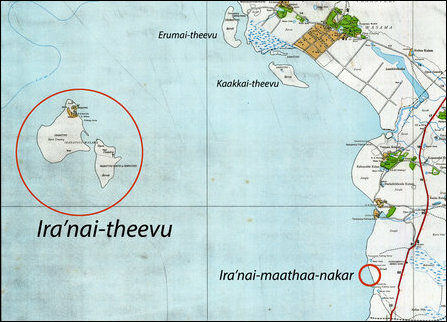 Ira'nai-theevu comes under the administrative division of Poonakari in Ki'linochchi district. From Naachchikkudaa to Ma'n'niththalai, the Poonakari region remains heavily militarised by the occupying military of genocidal Sri Lanka after 2009. The displaced families, dependent on fishing are only able to engage in one of their five traditional livelihoods, long-distance fishing, and that too under amidst hardships, the women say. 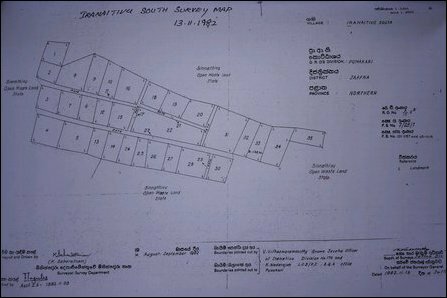 After the people were displaced to mainland, they slowly created a temporary coastal settlement of their own near Muzhangkaavil in the Vanni mainland during the times of the LTTE. 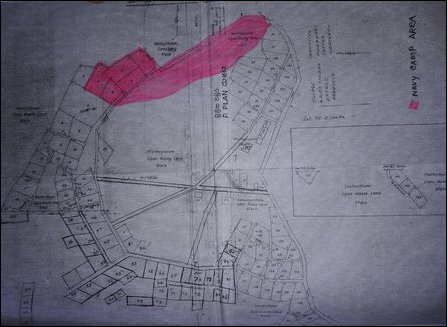 This settlement, later came to be known as Ira'nai-maathaa-nakar (the township of St. Mary of Ira'naitheevu). During the times of the LTTE, the fishermen were able to reach the islands and reside there for days and engage on fishing and related activities as the Sea Tigers became a formidable defence force in the territorial waters of Eezham Tamils. Now, the people are only allowed to access their church in the island once every year during the feast observed during the first Friday in March. Even on that day, the SL Navy will be chasing the ‘visitors’ away after 4:00 p.m. There are thousands of stray cattle (cows and goats) in the island. These are born to cattle owned by the people before their displacement. The cattle could be spotted from the fishing vessels in the sea. The SL Navy regularly catch these cattle for its consumption. The SL Navy also sell these to outsiders through Naachchikkudaa. 11.06.17 Women on protest vow to sail and seize Ira'nai-theevu with w..